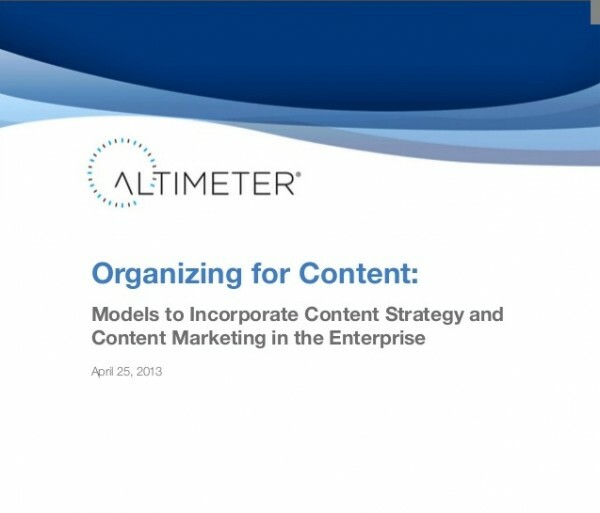 This week, the Altimeter Group published Organizing for Content: Models to Incorporate Content Strategy and Content Marketing in the Enterprise. The research, which is based on interviews with 78 practitioners, content services providers, and domain experts, is well worth a read. (Disclosure: I was among the interview participants.) The author, Rebecca Lieb, discusses how brands are challenged with organizing themselves around content marketing, and offers some models and suggestions to help. In general, the research is directly on target with what CMI is seeing with the clients we work with in an advisory capacity. 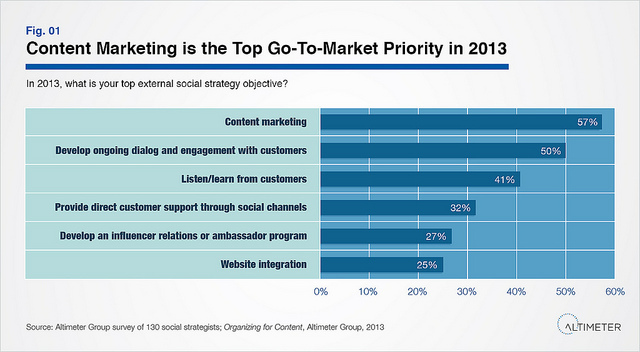 It also aligns well with our annual B2B and B2C content marketing research. Here are the key takeaways I think are most interesting for enterprise content marketers today. Content responsibility and oversight tends to be both reactive and highly fragmented, as illustrated below in the figure below. This highly typical diagram portrays how one major retail brand divides up content responsibilities between divisions that are not necessarily interconnected or in regular communication with one another. This fragmented approach leads to inconsistent messaging; huge variations in voice, tone, brand and messaging; and an inconsistent customer experience. The channel divisions themselves tend to be ad hoc, assigned primarily on the basis of hand-raising rather than any overarching content strategy. CMI’s take: Rebecca speaks to the siloed nature of marketing, which is something I recently covered a bit in my post on getting beyond the disillusionment of content marketing. To add a bit more context, most enterprise marketing groups we talk with are more frustrated with the process than they are with the content or the people. In our experience, many organizations believe they have the content and capability to create great content in narrow pockets. But, they lack confidence in their ability to align with and scale to the level they need to be at from a process standpoint. The overwhelming majority of organizations don’t have content divisions in their organizational charts. Very few have staff with the word ‘content’ or ‘editor’ in their title. Only nine of the brands interviewed for this report have made explicit content hires (i.e., titles such as ‘editor,’ or those that contain the word ‘content’). To align and enable efficient, coordinated, cost-effective, and strategic content strategy, creation, and production, companies/brands must organize for content. Band-Aid solutions neither scale nor will work, except in the very short term. Yet, creating a content department and bringing on costly senior talent are not always immediately feasible. Altimeter Group has identified the following enterprise models for governing the orchestration of content within organizations. The model any enterprise selects is determined by many factors — ranging from budget to the types and volume of content produced — which is why it’s important to stress these models are not hierarchical. Rather, each affords a more systematic, cohesive, and strategic approach to content marketing than what is provided by the current “adhocracy” models prevalent in most organizations. CMI’s take: The Altimeter research accurately suggests a few models that all have their pros and cons. Our experience is that many successful enterprises “find” their appropriate model — as opposed to “constructing” it. For companies that take content marketing seriously, they experiment a lot. Traditional marketing roles are modified, new roles are created, and processes that start out as “pockets” of excellence are often codified later. For example, the social team may be having regular editorial meetings, keeping a calendar, aligning with the marketing strategy, and so forth, but the rest of the marketing team has no idea this is going on. Finding your way (rather than constructing it) can be chaotic, but it’s also a productive method of getting to something that scales. 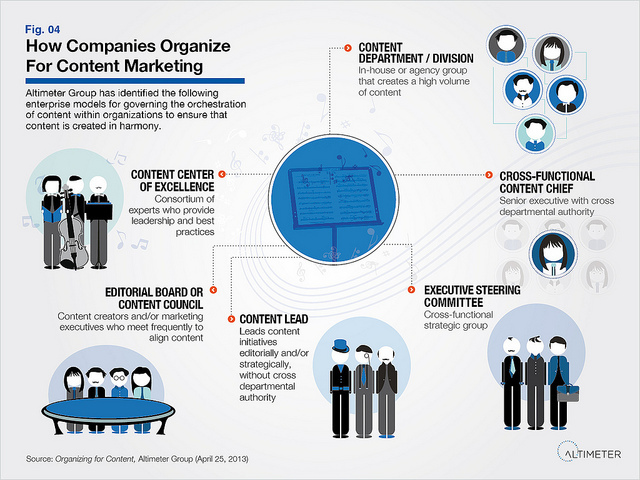 Creating a “Content Center of Excellence,” which is one of the models identified by Altimeter, is ultimately a way for enterprise-wide management to recognize that content is a strategic asset that deserves to be managed as such. Once this is recognized, the actual governance and reporting structure can more easily be achieved. Organizing for content is both a strategic and tactical undertaking. Businesses that fail to seriously evaluate how and where content fits strategically and operationally within their organizations will suffer in the short term as they strive to continue to create content without cohesion. They will be at a greater disadvantage in the months and years ahead, as content demands accelerate in terms of owned content and converged content hybrids in social media and advertising. CMI’s take: Taking both a tactical and strategic view is, again, definitely one of the best practices that we see — and it’s one of the biggest things that gets “fixed” when organizations build a newer, more holistic content marketing plan. Strategy and plan come first, as these are arguably the most important pieces. Joe Pulizzi touched on this in his post, 4 Truths About Content Marketing Agencies, and it’s something that agencies are now (hopefully) starting to build into their methodologies. Organizations interviewed for this report don’t have formal training programs dedicated to content staff. Rather, they hire experience (journalists, and also videographers, designers, etc.). Another model is to train outside of marketing, teaching sales, product, and customer groups how to recognize stories and write in the brand voice. CMI’s take: As the Altimeter research suggests, if an organization wants to create content on a consistent basis, one of the essential elements it needs to consider is training. We couldn’t agree more. At CMI, we’ve recently merged consulting and training because we recognize how tightly integrated a training program becomes, not only for individual practitioners, but also for the business itself. For many enterprises, content marketing is a new muscle, and as such, there are needs for initial training of groups, individual training for practitioners, and ongoing coaching to help it respond to changes in the marketplace. Creating a process and model around content marketing is something that is evolving. I’d love to hear what model you are using or what questions you have. What has your experience been? Let me know in the comments. For more information on how to structure your organization to manage content marketing, download CMI’s Content Marketing Framework: 7 Building Blocks to Success. Robert is the founder and chief strategy officer of The Content Advisory, the education and consulting group for The Content Marketing Institute. Robert has worked with more than 500 companies, including 15 of the Fortune 100. He’s provided content marketing and strategy advice for global brands such as Capital One, NASA, Dell, McCormick Spices, Hewlett Packard, Microsoft, and The Bill & Melinda Gates Foundation. Robert’s third book – Killing Marketing, with co-author Joe Pulizzi has been called the “book that rewrites the rules of marketing”. His second book – Experiences: The Seventh Era of Marketing is a top seller and has been called a “treatise, and a call to arms for marketers to lead business innovation in the 21st century.” Robert’s first book, Managing Content Marketing, spent two weeks as a top ten marketing book on Amazon.com and is generally considered to be the “owners manual” of the Content Marketing process. You can catch up with Robert weekly on his popular podcast - The Weekly Wrap. Follow him on Twitter @Robert_Rose.